Quilting Adventures: It's going all too quickly.....! It's going all too quickly.....! Busy, busy, busy is what it has been for me. Non stop, going and going..... I can hardly catch my breath! Last Sunday was my convocation. I'm glad I went, it was absolutely a wonderful ceremony marking the closure of a chapter in my life! We were ushered in by a bag piper! I just love the sound of bag pipes. The ceremony lasted over 2 (two) hours. Afterwards, we went to my mums for a BBQ. The following Tuesday we all left for Camp Overlook! Yep, both Stephen and I were chaperons for a school outing that lasted till Friday! We called it our family vacation at tax payers' expense! lol We all had a great time. Despite the busy schedule, I did manage to do a tad of quilting this weekend. If your recall, back in September 2008, while on a bus tour with my guild, I bought a kit in Pennsylvania! The kit consisted of these delicious fabrics. All 30 blocks are done for my Coney Island quilt, a pattern by Fig Tree Quilts. What a tedious block that was! So many pieces...... 29 per block to be exact! ;~ o Reminds me of the Corn and Bean quilt I made many moons ago. Nonetheless, they are done! I do want to point out that the fabric used on the top cone was a gift from Leigh, an Aussie, who sadly no longer blogs. Gosh, I think she sent that to me almost 4 (four) years ago. I've been saving it for a special quilt! Looks great as a cone. I still have a small piece left to use in another project! Thanks again Leigh for the fun mail. Lovely...that Fig Tree pattern is perfect for your beautiful fabrics! Busy is good! Another congratulations! This is going to be a stunning quilt, Carole! Ohhh, that really put a smile on my face. I am glad to see you have put the fabric to good use and on such a lovely block too. Can't wait to see the finished quilt.....no pressure tho, lol. Congratulations to you once again...what a milestone. Oh those blocks are just beautiful! Don't they say "idol hands are the devil's workshop"? Glad you are keeping so busy. I just posted my Nosegay pattern quilt that I did. It is a tedious project, but so worth it. Yours is lovely. Oops....that should be the other "idle". Too much hearing about the other "idol". Congratulations on the wonderful busy-ness in your life right now, all things small and large. Give yourself a pat on the back! I'm so glad you went....you worked so hard, you deserve the celebration! Quilt is looking wonderful....it's good that you got in some sewing time with the busy schedule. It's nice to hear that the shop is your "happy place". Love the way your Coney Island is coming out. Can't wait to see it finished! These blocks are great. You are the second person I have seen in the blogs making them and it really makes me want to give it a try. I am anxious to see how you will layout the quilt. It IS going too quickly, isn't it? New week will be the last full week in June -- what the heck! Your block is beautiful! Your quilt is going to be beautiful Carole. I love that!!!! It is so great that this chapter of your life is done, congratulations. 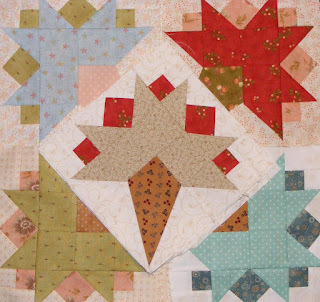 The Coney Island quilt will be beautiful, have you sewed the blocks together? Your coney island quilt is just wonderful, Carole! Bravo! great blocks Carole.. I know everyday I wish that time would stop for 1hour is that to much to ask?? hope the shop owning career is jetting off and that you are having fun..let us know what classes you are carrying and what your students and shop are up to.. totally interested!! !